A REVOLUTION in the law of PRESS RELEASE - amendment and practice after changes. How not to eat the press? Workshops in the series PERSONNEL ADMINISTRATION REVOLUTION IN LAW PRESS - revision and practice of the changes. 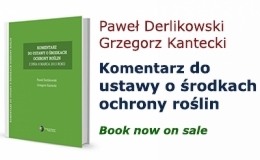 Copyright © 2019 Kancelaria Pasieka Derlikowski Brzozowska i Partnerzy, Adwokaci i Radcowie Prawni. All Rights Reserved.